The children and I went out to our favorite grocery store after lessons were finished today to buy several items for the tea party we are planning to enjoy during the Royal Wedding tomorrow. We also bought some gorgeous flowers to grace the tea table and I spent a lovely few minutes arranging them in a mustard crock. 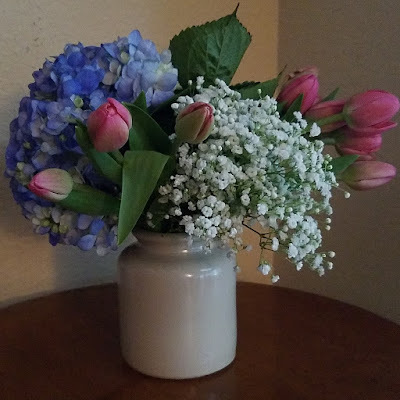 I have spent all the years of my flower arranging adult life avoiding baby's breath, but something made me pick up a little bunch to go with the tulips and hydrangea. I have to say that I love how it all looks together!